The movie matinee on Wednesday, August 22 at the Epsom Library is “Molly’s Game.” Directed by Aaron Sorkin and based on the book by Molly Bloom, the film is based on a true story of a world-class Olympic skier who ran an exclusive high stakes poker game for 10 years before being arrested in the middle of the night by FBI agents. Unbeknownst to her, the Russian mob was one of her biggest players and of much interest to the FBI. Her defense lawyer became her only ally. Please note that this is a change in schedule from the library’s August newsletter. Wednesday evening, the 22nd at 7:00 PM, sit back and enjoy “Music from the Woods.” Jimbo Pero, an Epsom native, will play a variety of music on his fiddle, including French Canadian and New England style fiddle music. He has been well-received at other musical events and we look forward to hearing him. Please join us. Epsom Public Library Tuesday, August 21st 6:30pm “Libraries Rock” with Singer/Storyteller, Steve Blunt. Join us for this wonderful event for all ages by one of our most popular entertainers. Refreshments included. Please sign up at the circulation desk. Over twenty years ago, Jan Hoadley of Epsom, heard about a local master basket weaver who was offering classes. Finding this activity to be quite enjoyable and a great way to relax from a busy teaching schedule, it soon became a passion for her. Retirement has given Jan a greater opportunity to devote more time and energy to developing this skill through further classes and personal enhancement. 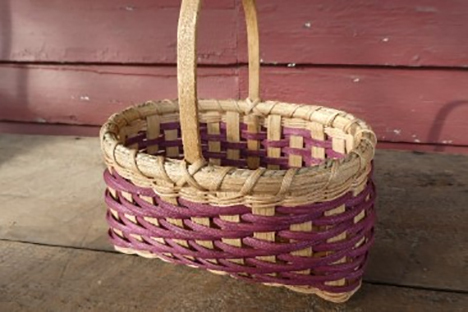 Jan’s baskets are made from quality reed, using a variety of different techniques. Some are simply decorative, most are functional, handcrafted in various styles, shapes and sizes. She particularly enjoys using colored reed to add interest and impact. It is exciting for Jan to create different designs and patterns, and to watch the shape of the basket unfold. Each basket has its own unique personality. Jan’s goal is to present a quality product that will be a welcome addition to any home and bring pleasure and enjoyment for many years to come. Jan has donated one of her unique baskets for Valley Artisans’ August drawing. Jan and all of us at Valley Artisans welcomes you to stop by the shop at 10 Goboro Road in Epsom and enter the drawing and check out our three rooms of locally crafted items. The Epsom Public Library will be having a community “Touch A Truck” event on Saturday, September 8th from 10 am to 1 pm. Join us for a fun, hands on opportunity to explore different community vehicles including a fire truck, police car, and construction vehicles from local businesses. There will be a “Bounce House” courtesy of “Blake’s Bouncy Business,” a Lego raffle, and refreshments available. Truck drivers are invited to a complimentary breakfast beginning at 9 am. Special thanks to Richard and Linda Clark owners of White Mountain Coffee for once again donating coffee/drinks. Call the library for more information at 736-9920.